Building the Unbalanced Force Particle Model – Physics! Blog! Hey guys, I want to show you something cool. Bring your new packet and a pencil and come next door. Students are pulling carts and taking data in the midst of the experiment. What kind of motion is happening here? What can we measure? How can we measure it? Those are the usual suspects. Some others might end up on the list, but they are getting pretty good at focusing in on what is relevant to describing the phenomenon at hand. So the next question becomes… which of these can we easily change and choose values for vs. which of these depend on the values we choose for other quantities. 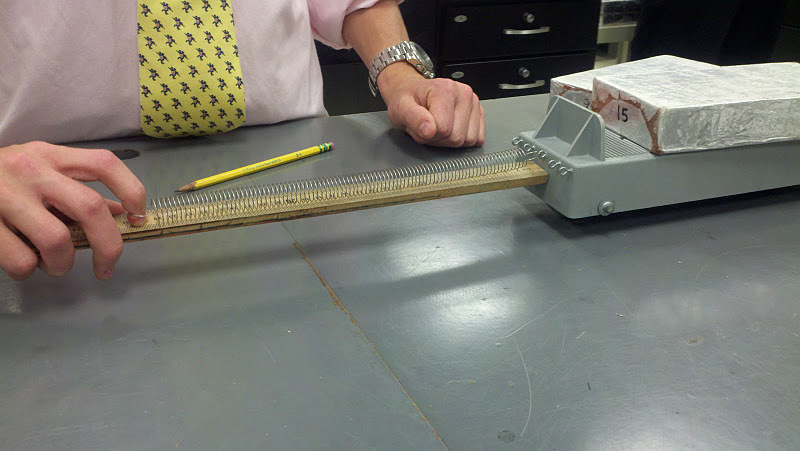 It becomes clear that we can easily change/choose the mass (add/subtract bricks on the cart) and the force (add more parallel springs), but that the acceleration value will depend on those quantities and not be easily chosen. We decide to leave the spring stretch constant so that we can measure spring force in “number of springs”. Sounds like we’re about to do two experiments. By now they also know that their objective should be in the form of “Find a relationship between…” so with little prompting, they list the objectives for these experiments. Find a relationship between acceleration and mass. Find a relationship between acceleration and force. We agree to graph both experiments with acceleration on the vertical axis so that we can more easily compare how mass and force affect acceleration. And we’re off: Taking data! They now know just what to do for their experiments (they decided what to measure and how to measure it, after all!) and so they don’t really need any instructions, but in this experiment it is worth the investment of 3 or 4 minutes time to give them a few tips about how/how NOT to take this data. The most important “tip” you give them is already over. If you didn’t model good form in pulling the cart during the demonstration at the very start of the pre-lab, there is, say, a 95 – 100% chance that some if not all of the groups will do wrong exactly what you did wrong when you were pulling the cart. So in your first demonstration, you should have been careful, attentive, and deliberate in how you pulled the cart. Now is the time to give tips about common mistakes. They will laugh at seeing these since they will so obviously result in bad data, but if you don’t show them, at least one or two groups will do most of these. One or two groups still might do some of these, but they (and their group mates) will recognize what they are doing and probably correct it on their own. The “I’m too lazy to move my feet” mistake: Stand in one spot and try to pull the cart like that. Spring and ruler twist toward you as the cart moves. The “Come on, hurry up already!” mistake: Be impatient with the slow start and overstretch the spring trying to speed it up. The “Don’t mess this up!” over-careful mistake: Pull the cart with the ruller touching the cart the whole way. Finally, give them a few more guidelines for successful data taking. Get one student calibrated at pulling the cart. That student should practice several times before you ever take any data. Don’t switch people pulling the cart. And make it easier on the puller by starting with the easiest data to take (one spring in the force experiment or 4 bricks in the mass experiment) and moving toward the hardest data to take (five springs, 1 or 0 bricks). Use one spring when you do the mass experiment. Use four bricks when you do the force experiment. 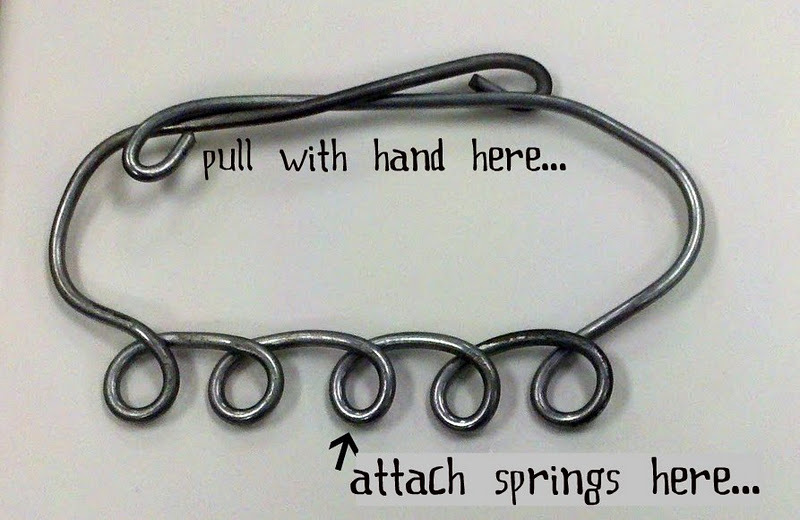 Use the spring puller to pull with multiple springs (hooking them through different fingers works… but it’s not pretty). Let’s agree to have the length of the spring always be 30 cm. 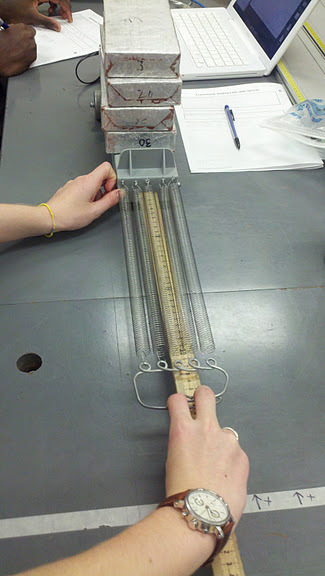 This is the first experiment in my class where they take non-linear data. (Of course, they don’t realize that right away.) 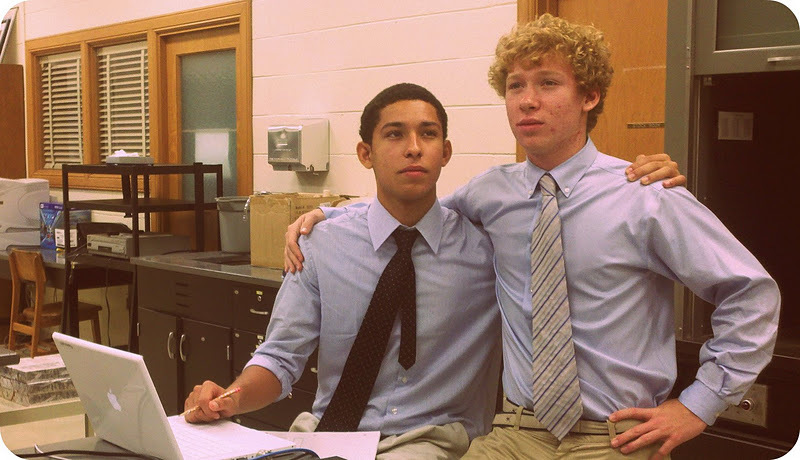 In Honors Physics, they’ve been using a graphing program since the force experiments in BFPM. In regular Physics! they’ve been graphing by hand, so using LinReg is a new experience for them. 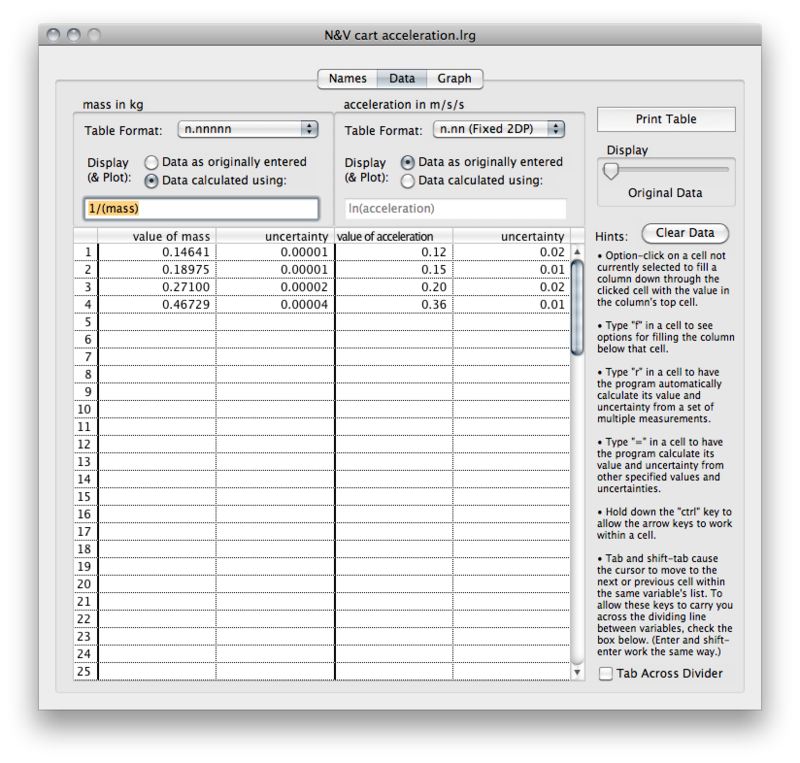 There are some little foibles of using the program (maybe another post on that later), but overall… it rocks! Much easier than using Excel, still gets the idea of range in measurements, much quicker for them to figure out, and makes linearizing graphs intuitive and simple. We’re using LinReg for the first time this year, but I’m a fan already. 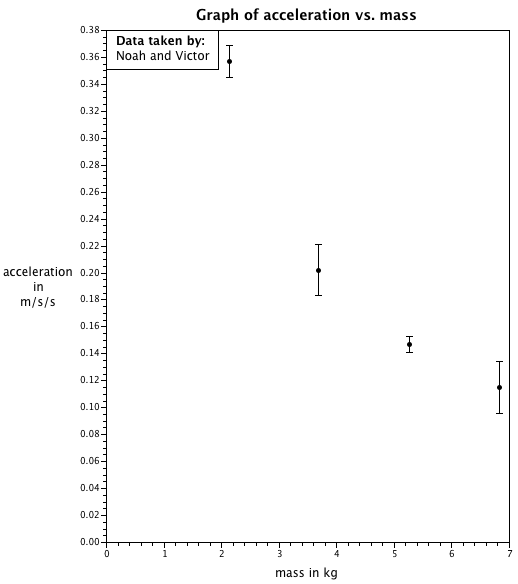 Okay, let’s plug our data into LinReg and check out the acceleration and force graph. So you think the acceleration is directly proportional to one over mass. [You can see the gears turning in their heads as they consider whether that’s the same as the “one over x” that they said before…. and eventually, “Yes.”] Okay, so if you graphed [pointing] acceleration vs [pointing to the horizontal axis now] one-over-mass, you would expect it to be directly proportional. [More gears turning and thinking… and then, “Yes,” though you might have to go through that again a couple of times while they process it.] So we would really like to graph acceleration vs one-over-mass and check that it gives us a linear, directly proportional graph. Here’s where LinReg gets really awesome. Let’s go back to the data screen. We can get it to graph things that it calculates from our data. So instead of mass, we want to try 1/mass. The data might disappear because of some quirk in the programming. Just click back and forth between the radio buttons once and it will come back. No worries. But then… Oh no, it is all zeroes now! Oh wait, it is just really small numbers. We can change the number of decimal places. And… there. All better. Now we go to graph it again and… it asks for updated units. Right, right. So if the units for mass were kilograms, then the units for 1/mass must be 1/kilograms. Enter that in… And then the graph appears. Wow! That looks linear, now! Great work, guys. Save that graph. So now that we’ve got the relationship between acceleration and net force and between acceleration and mass, we need a way to combine them. We kept mass constant for the force experiment and we kept force constant for the mass experiment. We need to put these relationships together, but not using substitution. We really need to superimpose them. We need to overlay them with each other since each experiment kept the other variable constant. We’re looking for what the relationship would be if we changed both mass and force at the same time. They suggest something like or . We massage that into . We remember that we can replace with “equals, times a constant” and come up with . I tell them that the Newton (which they have been using since BFPM—the Balanced Force Particle Model) is defined so that . After looking at it for a minute, they decide that the constant in must be equal to 1 (with units that turn into Newtons). So we can simply write it as . Whoa. Think about that for a minute. If you know all of the forces on your object (and you know what object it is, so you know the mass), then you can predict where that object will be in the future. That’s some powerful stuff, man. That seems like a pretty big idea. Actually, that seems like the biggest idea we’ve had (so far, at least). In fact, that’s one of the three biggest ideas we’ll have all year. Now, would it surprise you to hear that someone else has already found this relationship before we got to it? Darn you, once again, Isaac Newton, for having been born hundreds of years before us! So, okay, okay, other people call this thing “Newton’s 2nd Law”. If you have a lot of class time, a lot of student interest, or just a group or two that finishes more quickly than others, there are of course more little investigations and paths to go down. 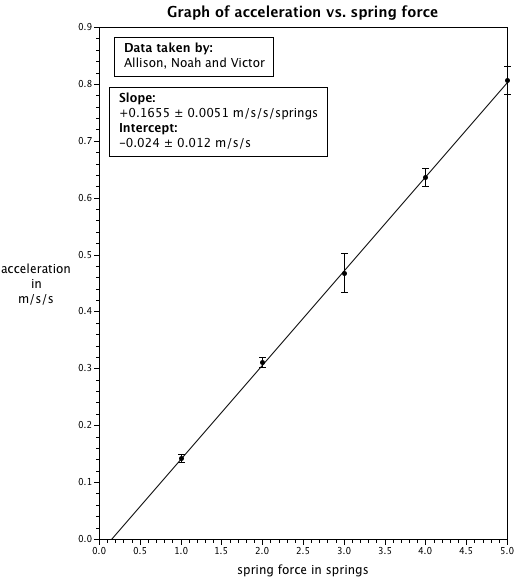 Students could try to find the acceleration of the cart when the net force is just friction (just push the cart and make the velocity-vs-time graph) and see how it relates to your acceleration-vs-spring force graph. Does knowing that value help you make a shift of the graph so that you can find a directly proportional relationship? 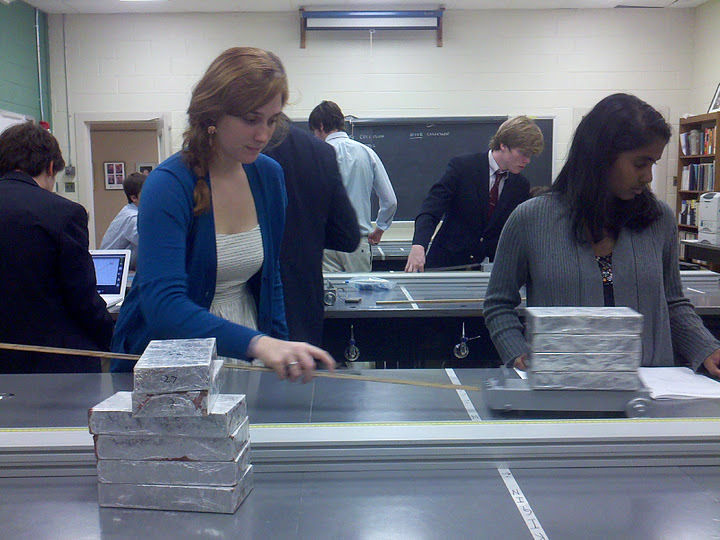 Students could find the value of the spring force in Newtons (do that experiment that they wanted to do above) and see whether the slope on the acceleration-vs-force graph has anything to do with the mass in kilograms of their cart+bricks. Etc, etc. How does one get/make a multiple-spring puller? I think it’s basically a wire that is bent into shape. Good stuff, as usual. Nice tip on the LinReg program. Just played around with it for 5 minutes or so. Waaaaaay easier than using Excel. Definitely using that in the future. Thanks! Yes, using LinReg this year has been amazing. Actually, I’ve always handwaved the linearizing a graph with my regular students. No longer! Kelly, very nice. You say you tell them that 1N=1kgm/s^2. 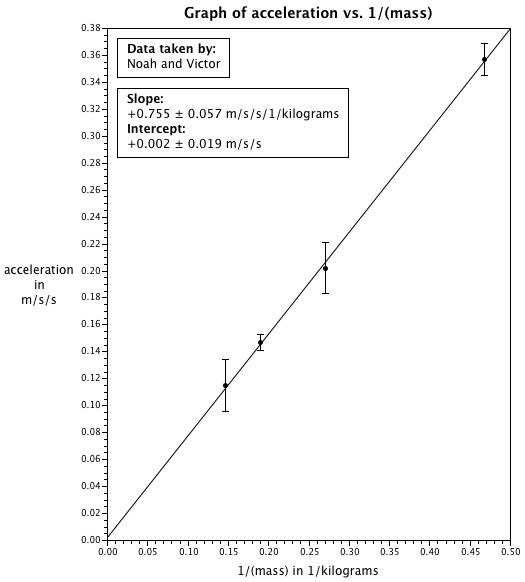 Have they had a chance to figure this out by comparing the 9.8 N/kg slope (from the weight vs. mass lab) to the 9.8 m/s^2 slope (from a “find” g from a v vs. t graph type lab) and using that for defining 1N? Just curious. While my students do figure this out, it seems like I still have to remind them of this when they are evaluating slopes in the Fnet vs a lab as well as the m vs. a lab. My students have never found an acceleration of 9.8 m/s/s. We don’t do projectile motion until after momentum (so it is Unit VI for us). They’ve been using Newtons as a unit of force since BFPM. We define g to be the gravitational field, never an acceleration. Does that help? Yep. Is your order CV, BF, UBF, CA? Never mind, I snooped on your blog and found your unit order. You must wait until projectile motion to investigate the free fall acceleration. I love the “spring holder”! Interesting stuff. I tried to do an inquiry like this and found it very difficult to get good data. Using spring gauges, we found that pulling the carts resulted in the spring force jumping up and down a lot. We ran out of time to perfect the method (with some groups getting useable but not great data). I suspect that we need springs with relatively small spring constants combined with a large amount of mass and very slow accelerations, and maybe 3 m of space to pull the carts. Unfortunately my facilities are rather lacking in this regard due to the space available where there are computers. The carts will also need good bearings. I’m wondering what your experience has been with equipment and parameters? Where did you get these springs? I’ve been searching around for springs with a low enough spring constant, and struggling to find any. I’m not sure where the original springs came from. I’ve changed schools now, so I had to figure out how to do this experiment with different materials. This year, the kids used these (http://www.pasco.com/prodCatalog/ME/ME-8999_ids-spring-kit/index.cfm) and regular carts and tracks. They only used one spring, but stretched it to different lengths. It wasn’t as good as my old setup, but I think I’m going to move toward using fan carts next year. We used fans this year in some sections for the mass-acceleration experiment, and they worked really well.